Check each teacher's class schedule by clicking the link below the teacher bio. Peninsula Music Together team! Dedicated to making lives more musical! Our teachers are passionate about music and children and create a fun, uplifting, engaging and educational classroom that supports each child's and parent's musical development while they rediscover the pleasure and educational value of informal music experiences. Music Together® applies the latest research in early childhood music development to the program. Music Together trainers personally meet and train each teacher. 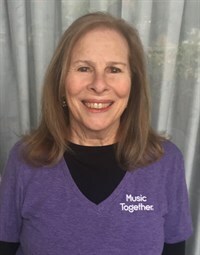 Teachers enjoy ongoing skill development workshops from Music Together LLC, and further teacher support and training throughout the year from PMT Director, Pam Donkin. Are you or someone you know, interested in learning more about teaching for Peninsula Music Together? Contact us! Pam Donkin is Center Director/Owner of Peninsula Music Together. Teacher Pam is an award-winning children's recording artist, on the acclaimed Gentle Wind children's record label, who has been a children's performer and music specialist for over 30 years. She was trained by Music Together to be a registered Music Together teacher over 15 yrs ago and was awarded Music Together Certification Level I for outstanding achievement in teaching, musicianship, program philosophy, and parent education. Music Together Founder, Ken Guilmartin commented that "Pam is a Master teacher". She does not teach regularly but does substitute from time to time! Pam, who has won 7 national awards for her own CD's on Gentle Wind children's record label, has toured nationally, offering fun, educational, interactive library programs and family concerts. If you are looking for new and fun CD's for your family go to http://www.pamdonkin.com/. Pam's signature song, Planting Seeds of Love, is available for Free Download here! 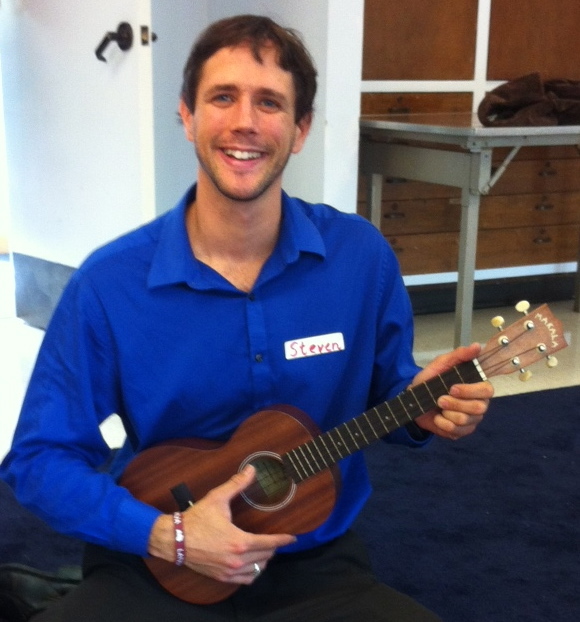 Teacher Steven is the father of a young son and began his Music Together journey as a parent in one of our classes! He was so impressed with the program that he took the Music Together training so that he could help other families encourage musical skills with their children. Steven is a natural leader, with a wonderful voice and is extremely musical and lots of fun! He has played piano since the age of 4, providing entertainment at numerous community and retirement facilities, parties, and at Stanford Medical Centers. He also plays trombone and penny-whistle by ear and Ukulele! He is bilingual, speaking both English and German and has a BS degree in Environmental Studies. Steven is a registered Music Together teacher. Teacher Steve is a life-long musician and an award-winning multi-instrumentalist who is the father of two grown children, with whom he sang and played daily. After earning a Master of Music Education degree and working at the junior high school level, he began sharing folk music in local pre-schools. Originally from rural Ohio, he has worked in the inner cities of Chicago, Denver and Kansas City, and is currently a nationally-known traveling musician and music educator. 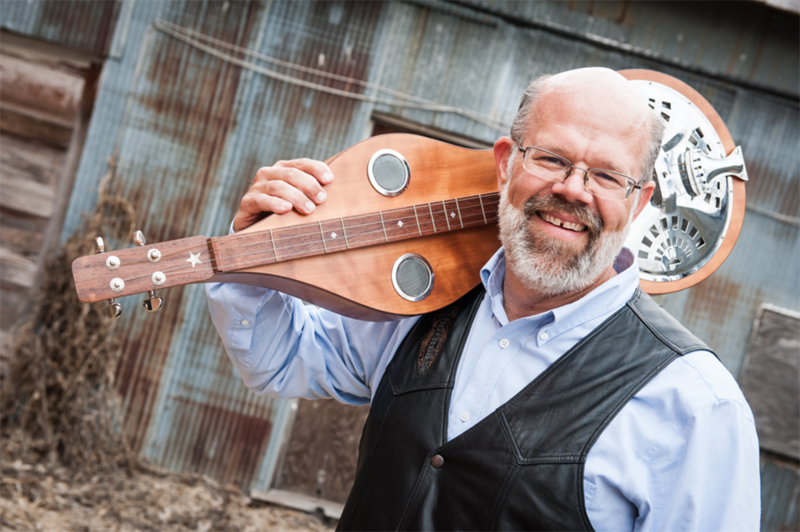 Teacher Steve, a calm and caring teacher, uses mountain dulcimers, mandolin, guitar, autoharp, ukulele, percussion, didjeridoo, harmonica, banjo and banjammer in his classes. Teacher Steve loves the Music Together program for how it emphasizes the vital role that parents and caregivers play in the musical upbringing of young learners. Teacher Steve is a registered Music Together Teacher. Here is a link to his Folk Music for Little Folks EP. 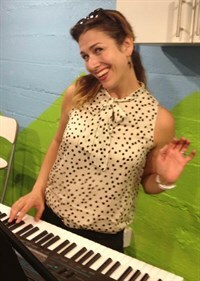 Teacher Alia Stadlander, is warm, energetic and playful! Music has always been a large part of Teacher Alia’s life. She was an All State vocalist and performed musical theater in several corners of the world. She graduated with a BFA in Musical Theatre from the world renowned Tisch School of the Arts at New York University. Alia found Music Together as a first time mom while living in Minneapolis MN, several years ago, and eagerly took the Music Together training, teaching for that location. Now, as a California resident, and mother to two, she is super excited to share family music making with you and your little ones. Teacher Alia is a registered Music Together teacher. "We just had our last day with Teacher Alia and it was a GREAT session! Henry absolutely loved Alia, and she was so fantastic with the kids. I just signed up for next session with her as well!" Katherine, parent. Teacher Chris brings warmth and fun energy to his classes, plus amazing guitar skills! Chris has been playing and performing on guitar and vocals for many years in various ensembles, in addition to his solo acoustic guitar shows. He is currently teaching music to kids with special needs at the Arbor Bay School in San Carlos, California, and is very excited to join the Peninsula Music Together team. His daughter loved the program and still sings the songs she learned during three years of sessions at PMT! He also plays bass, harmonica, and piano, and is currently working towards a degree in Music Therapy. He has a BA in music from San Francisco State University. Chris is a registered Music Together Teacher. "I wanted to let you know that the boys are loving the 3-4 yr classand specifically Teacher Chris - their school music program is pretty rigid, and Chris allows them to be a kid - while they get very “big” energy in class, it is a great counter balance to their school day. We have signed them up for Chris’ Winter class, as well as Rhythm kids!" NEW COMING THIS WINTER! Sandy will teach two bilingual Music Together con español classes, one at Burlingame and one at Beresford Center! Sandy is a native Spanish Speaker. Teacher Sandy is a spirited and fun Music Together teacher who previously Directed her own MT Center in North SM County. Sandy made her musical debut at age 5 in her native Mexico City. Since then, she has made music and performing her life. She studied Jazz, extensively at the National University and Superior Schools in Mexico City. At that time, she founded and organized several Jazz festivals and opened for the great B.B. King with her vocal group Cuicanitl in 1995. She received scholarships to study at the famed Berklee College of Music and graduated with top honors in Vocal Jazz Performance in 2001. She has recorded numerous independent albums and currently performs every Sunday at the Hyatt Regency SFO as the featured Jazz Brunch vocalist and also with her Latin Jazz Band, “Ritmojito”. The parent of two young boys, Teacher Sandy is a registered Music Together teacher. Teacher Brittany, better known as Breeze, for her uplifting and fun-loving personality, is a native of Burlingame. 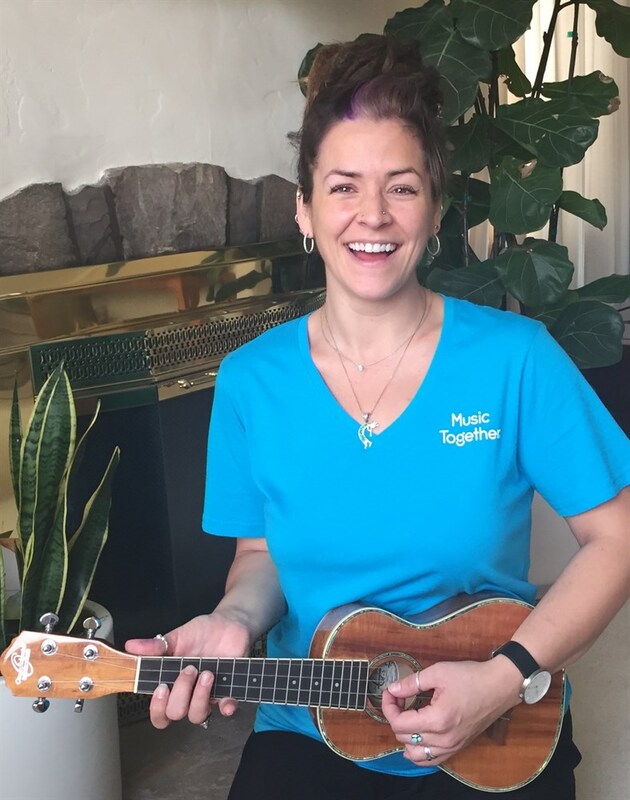 She found Music Together attending our classes as a Nanny, falling in love with the program, and decided to take the Music Together teacher training. Teacher Breeze’s has found endless joy through choirs, bands, theatre and dance for as long as she can remember. As an experienced drum major, clarinet player, piano player and most of all, lover of singing, she has a natural aptitude for music. Bilingual in Spanish, she studied Sociology and Spanish at University of California, Davis, and has taken classes in Early Childhood and Family Development, Community and Regional Development, aspiring to be a Family and Marriage Therapist. Additionally, Teacher Breeze has taken training as a nanny and has found caring for children to be of the utmost importance in shaping her life, known for inspiring little ones to be musically creative and fearless. As a natural leader, Teacher Breeze specifically chooses to convey music, as a fun way of learning, to everyone she meets. Breeze is a Registered Music Together Teacher. "Teacher Breeze is one of the most intentional Peninsula Music Together teachers that I have ever met. She is so engaging with all the students and brings the energy that children, parents and nannies need!" Natasha Domingo, Burlingame Rec participant.